We gratefully acknowledge the support of the Best Start Resource Centre in the development of the cut outs. These cut outs have been prepared with funds provided by the Government of Ontario. The information herein reflects the views of the authors and is not officially endorsed by the Government of Ontario. For the launch of Breastfeeding week in Canada October 1 to 7, we worked in collaboration with Strive Niagara (previously known as Adolescent’s Family Support Services of Niagara AFSSN) to bring to life our “Breastfeeding in Public” Campaign. The Campaign was funded by a grant awarded to us to work to increase the success that young mothers under the age of 25 report with breastfeeding. The campaign was inspired by a 2008 campaign hosted by Marin County. The four beautiful moms that were photographed resulted in 8 cut outs that were placed throughout the Niagara Region during the month of October. The cut outs were initially introduced to the public at the Breastfeeding Challenge that is hosted annually by the Coalition. The feed back received has been fabulous. The cut outs went viral when they were picked up by social media and were shared hundreds of times. There’s a mom at a mall, standing up and nursing her young child. She holds a sign in her hand that reads, “When breastfeeding is accepted, this won’t be noticed.” And you can’t tell her to cover up or head to the bathroom (even if it were legal to do so). In fact, she won’t even notice you’re there — because she’s a life-sized sign designed to promote acceptance of breastfeeding in public. The topic of breastfeeding in public is one that has two distinct sides — some feel moms should cover up, retire to a different room or leave the premises when their babies need to nurse. Others, myself included, feel moms should be able to feed their babies whenever they are hungry. It’s not immodest or low class to nurse a baby, even if you don’t cover up. But it’s hard to change public perceptions if more women are not openly nursing their children without fear. That’s where these breastfeeding signs can really make a difference. These moms are comfortable, confident, relaxed and self-assured. 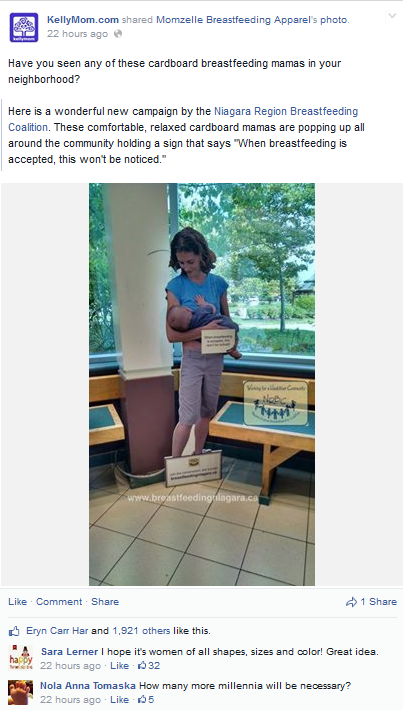 They’re just moms, feeding their babies, and placing the signs around the community (this one is sponsored by the Niagara Region Breastfeeding Coalition in Ontario, Canada) will help normalize something that is already quite normal. She also says these signs can help breastfeeding moms feel welcome and supported. This can make a huge difference in how a breastfeeding mother feels as well as how she is perceived by others. It’s not normal for a mother to force her infant to wait to eat while she wails in despair because Mom’s worried about what other people will think. Being able to breastfeed at the mall, at the doctor’s office, at the library, at Target — that’s what we should encourage moms to do instead of breaking the law by asking them to cover up or move. Those who say, “I support breastfeeding, but…” really don’t support breastfeeding at all. It places a burden on a mom, forcing her to put the needs and comfort of her child and herself aside for the perceived comfort level of other people, who can simply look away. It doesn’t make sense, does it? more support nursing moms have, the better it is for everyone.